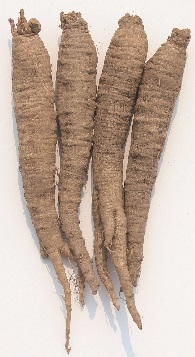 The root is as big as bell flower and called it white ginseng and wild plant. Stem grows about 2~3m in height and bind-weed. Milky liquid is saponin as same as ginseng. It is good for bronchitis, a cough, removal of fever and detoxification. Can be harvested in 2~3years on October and November with 30~50g in weight. The shape of flower is a bell with green-white outside.